While you may cherish the smell of your grow room, you may not want the smell wafting into other rooms, or worse, extending outside your house altogether. It is important to remain discrete, and indoor gardens can be especially pungent. This is a problem every grower will encounter at some point. How do I control the smell of my grow room? Step one to controlling odors in your grow room or grow tent is sealing the environment. If you are growing in a spare bedroom, this means ensuring there are no leaks anywhere, via windows or doors. The only way air should be coming and going is through your ventilation system. You can use a complete ventilation and odor control kit, or you can piece one together with our intake and exhaust filters. 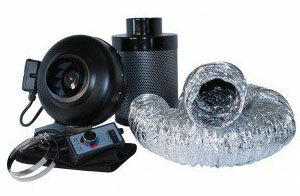 The grow room intake filters brings clean air in with a fan, and filters out particles that could harm your plants. The grow room exhaust filters expels smelly, dirty air, after first passing it through a carbon filter. Do carbon filters remove odor? A proper exhaust system will include an exhaust fan and carbon filter. The filter can be placed before or after the fan, but either way, the odors will be drawn through the carbon filter and be eliminated. Carbon filters are very effective, because the activated carbon in the filter attaches to odors and traps them. Some will inevitably get through, and as the filter wears out, this will become more apparent. It is important to change your filter regularly to keep odors under control. Can you clean carbon filters? Depending on how big your grow room is, and how hard your filter has to work, you will need to replace it every few months. You will know it is time to replace it once you begin to smell your garden again when outside of it. Some growers opt to clean their filter instead of purchasing a new one. This can work, but the filter will never operate as efficiently as it did when it was new. Nevertheless, there are certainly ways to clean your filter for repeated use if you are ok with decreased performance. Do grow tents keep the smell in? For maximal odor control, use a grow tent. These will keep odors in far more effectively than a grow room would, because they are entirely sealed off. They contain built in ventilation systems, and offer a level of privacy otherwise impossible. When using a grow tent, be sure you employ a carbon filter to prevent the smells from extending out of your tent into other areas of your house! At Hydrobuilder we carry additional ways of eliminating odors from the grow room or green house, some of which are considered the most technologically advanced odor control systems. Others are just a quick fix and can mask smells. The extent to which you want to eliminate odors will depend on the level of privacy and discretion you want. Ozone generators are a great way to reduce odors even further. These systems employ three atoms of oxygen (O3) which attach to odors and eliminate them in the grow room or greenhouse. These are the most technologically advanced method of eliminating unwanted smells. Growers always wonder if ozone can be harmful to plants, or even themselves. The levels in which ozone generators operate at is entirely safe for plants and humans. Ozone is commonly used in hospitals due to its air sterilization capabilities! Be sure to carefully read the information included with your ozone generator, as this will define safe levels of use. Ozone can be harmful, however, in large doses, so be sure to closely monitor how much you are generating. Surface and air purifiers are generally used in commercial greenhouses or warehouses, or by those who are serious about odor removal. These machines contain filters, and are able to remove odors at an impressive rate. On top of eliminating odors, these machines will also remove harmful compounds, such as carbon monoxide, from the growing space! If you are doing everything you can to prevent odors and are still able to smell your plants, try masking the smell. Odor absorbing gels, sprays, and mists can supplement your carbon filter or other air purification method, but will usually not eliminate odors on their own. A common trick is to put odor absorbing gels in your ducting, so that the smell of the product mixes with the smell of your garden and dilutes it. If you have any questions about managing odors in your grow room, give our experienced growers a call at 888-815-9763! We also have more information on odor control and ventilation in our learning center, under the environment section.